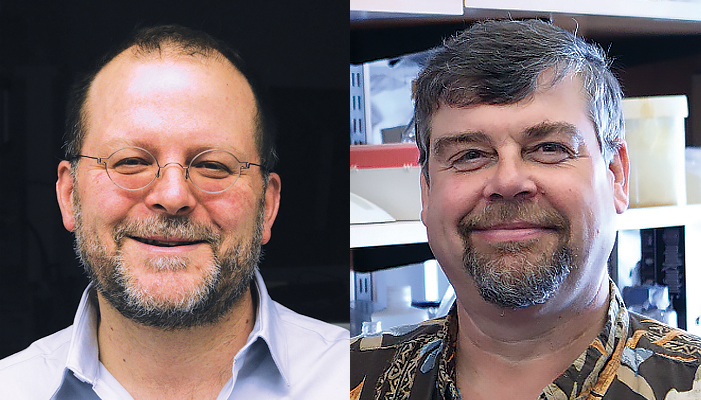 Patrick Kiser, PhD, associate professor in Obstetrics and Gynecology (left), and Thomas Hope, PhD, professor in Cell and Molecular Biology (right), are principal investigators of the new study. Northwestern Medicine scientists have received a 5-year, $17.5 million grant from the National Institutes of Health (NIH) for an interdisciplinary project that aims to invent, develop and test an implantable drug delivery system to protect high-risk individuals from HIV infection for up to a year at a time. The Sustained Long-Acting Protection Against HIV (SLAP HIV) program, funded by the NIH’s National Institute of Allergy and Infectious Diseases (NIAID), will bring together 15 basic scientists and clinical investigators from 15 departments across Northwestern University Feinberg School of Medicine, McCormick School of Engineering and Kellogg School of Management. Currently, there are three ways to prevent sexual transmission of HIV: abstinence, condoms and taking antiretroviral drugs every day. But adherence to each of these methods is low. Kiser and Thomas Hope, PhD, professor in Cell and Molecular Biology, Obstetrics and Gynecology and Biomedical Engineering, will be the principal investigators of the project. In the project’s first year, Kiser and Hope will work together to invent a new kind of implant that delivers antiretroviral drugs in a controlled way. Specifically, they are interested in a drug called cabotegravir, which stops the HIV virus from putting its DNA into a host’s genetic material. “Technology like this could be an important tool in fighting the global HIV/AIDS pandemic in the U.S. and in low-income countries,” Kiser said. “This can provide a way to protect high-risk individuals while we wait for the development of a protective vaccine,” Hope added. Scientists from multiple institutions involved in the project will develop and test two additional drug delivery platforms. The investigators will then select one to pursue for clinical development. “The funding of this project represents a new era in HIV prevention research at Northwestern and places our team at the cutting edge in both basic science and clinical development of HIV prevention and treatment technologies,” Kiser said. Additional Northwestern Medicine investigators involved in the study include Richard D’Aquila, MD, professor, Babafemi Taiwo, MBBS, ’06 GME, associate professor, and Harry Taylor, PhD, research assistant professor, all in Medicine-Infectious Diseases; George Greene, PhD, research assistant professor, and Brian Mustanski, PhD, associate professor, both in Medical Social Sciences and Psychiatry and Behavioral Sciences; Cassing Hammond, MD, associate professor in Obstetrics and Gynecology; Srinadh Komanduri, MD, associate professor in Medicine-Gastroenterology and Hepatology and Surgery-Gastrointestinal and Endocrine; Robert Murphy, MD, director of the Center for Global Health and professor in Medicine-Infectious Disease and at the McCormick School of Engineering; and Monica Rani, MD. Investigators from Johns Hopkins University, Tulane University, Eastern Virginia Medical School, University of Chicago, University of Utah, Columbia University, Case Western University, University of North Carolina and University of California, Los Angeles will also participate in the project. The project is funded by NIH NIAID grant UM1 AI120184.